Did you know it takes more power to run your hair dryer than it does to run the fridge? Obviously, unless you're a hairdresser most people only use their hairdryer for short periods of time each day so the costs of running the appliances are vastly different. But from an energy used point of view, a small hairdryer needs more juice for a blow dry than a family sized fridge does to keep the milk cold. Many don't realise that small appliances can require just as much power, sometimes more, than larger items. However, it's not uncommon to see several small appliances plugged into a single power point. Often with double adaptors banked on top of each other, or with power boards added on to provide enough room for the toaster, kettle, coffee machine, juicer etc. That's a lot of power demand for a single electrical outlet. 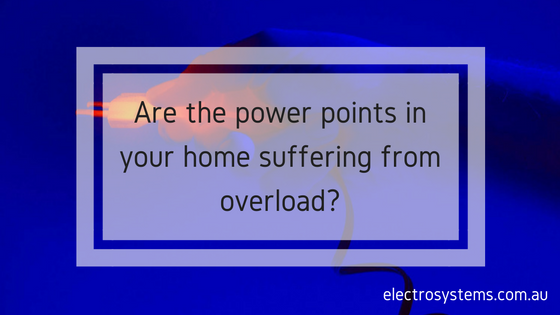 Overloading power outlets can cause overheating which poses a serious risk electrical shock or fire. The safety switch or fuse trips regularly, often at times of peak power use in the morning or evening. You have a power board plus a double adaptor in one wall socket. You discover burn marks or melted parts on the power point cover, plugs, cords, or adaptor. Use power boards with a built-in safety switch rather than double adaptors. Don't plug adaptors into adaptors. Regularly check for signs of overheating - burn marks, melting plastic, burning smells, sparks. Don't overload points or powerboards - large items such as the dryer, washing machine, dishwasher, and fridge should have an electrical socket per appliance. Unplug items not in use. Never use electrical equipment with exposed wiring, broken leads, melted or blackened areas, or visible damage. Arrange for a licenced electrician to install extra powerpoints in the areas of your home with frequent multiple appliance use such as the kitchen, bathroom, or loungeroom. Items such as the air conditioner, electric hot water system, and electric oven which require a substantial amount of power may need a dedicated circuit installed by a licenced electrician. Do you need an extra electrical outlet installed in your Brisbane home? Speak to our experienced electrical team about ensuring your home remains electrically safe on 3881 0956or complete our booking request today.